Right and Wrong no longer exist. The most suspenseful thriller of the year explores just how far we will go to protect ourselves and our country. When a nuclear expert-turned-extremist (Michael Sheen) plants devices in three separate cities, the country's counter-terrorism force springs into action and captures him. But the location of his bombs remains a mystery. With time running out, FBI agent Helen Brody (Carrie-Anne Moss) agrees to work alongside a mysterious interrogator known only as "H" (Samuel L. Jackson), whose ruthless methods get results. But a power struggle develops between Brody, "H', and the terrorist, and what happens next is unbelievable and -ultimately- Unthinkable! With George W. Bush out of the White House, the “War on Terror” no longer regularly occupies front-page news. This means we hear less about the controversial methods sometimes used to pursue terrorists. 2010’s Unthinkable reminds us of the thin line between acceptable interrogation and torture. American Steven Arthur Younger (Michael Sheen) becomes a Muslim and changes his name to Yusuf Atta Mohammed. He also turns on his homeland and enters the world of terrorism. A former military bomb specialist, Younger claims he made three nuclear weapons and planted one each in various cities. While a mix of authorities attempt to locate the bombs, the movie focuses on interrogation. After Younger shoots a cop, police arrest him easily – probably a little too easily – so assorted parties grill him. Special Agent Helen Brody (Carrie-Anne Moss) plays good cop, while mystery man Henry Humphries (Samuel L. Jackson) – better known as “H” – does the bad cop thing. A pretty violent bad cop thing at that, as the interrogation takes dark turns. To say the least, Unthinkable enters provocative territory. Does it do much to further debate about the use of torture as an interrogation device? Not really, partially because the movie wants to have it both ways. One minute it throws out the notion that the end justifies the means, but then it tosses in thoughts about how torture lowers us to the level of the terrorists. Both sides of the argument have merit, but the manner in which Unthinkable engages them seems awkward and ham-fisted. The result seems less philosophically compelling and more wishy-washy and ill-defined. I suppose it’s good that the tale doesn’t shoot for easy answers, but it’s just too flabby in its debate. There’s little in the film that seems likely to provoke much conversation. It doesn’t help that there aren’t many thrills in this thriller. Much of the time, Unthinkable feels like dueling op-ed pieces. Oh, we do get the requisite shots of authorities trying to find/stop the bombs, and the interrogation uses different techniques to add drama. Some of these occasionally work, but too often the movie grinds to a halt to let characters espouse their worldviews. Those moments don’t blend well with the story and feel like editorializing. Unthinkable does provide a good cast, especially for something that ended up going straight to video. Jackson doesn’t do a whole lot with “H”, unfortunately; he’s potentially the most complex character here, but Jackson fails to make him much more than a thug. Moss also lends a fairly one-dimensional portrayal of the flick’s token bleeding heart, but Sheen does quite well as the nominal villain. Sheen has slowly evolved into one of the most versatile actors in the business today, and he gives Younger a broadness that usually would be absent from this sort of role. 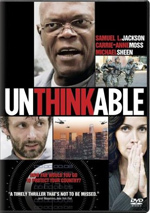 I do admit that Unthinkable provides decent drama, largely because the nature of the subject matter leans that way; honestly, it would be tough to make a movie about this topic that lacked any tension. I simply don’t think it digs into the material with particular gusto, and the simplicity of the treatment makes it less than enthralling. Unthinkable appears in an aspect ratio of approximately 1.85:1 on this single-sided, double-layered DVD; the image has been enhanced for 16X9 televisions. The movie came with a generally positive presentation. For the most part, sharpness was fine. Wider shots tended to be somewhat soft, a factor exacerbated by light edge haloes. Still, overall definition tended to be good. No issues with jaggies or moiré effects occurred, but digital artifacts were a mild distraction, as they demonstrated some noise. Source flaws remained minor; I saw a few small specks but nothing more. As expected from a dark thriller of this sort, Unthinkable came with a subdued palette. It went with a fairly sepia tone that favored a brownish tint. This meant the film lacked prominent colors and could appear a bit drab. Nonetheless, the hues were acceptable given the stylistic choices. Blacks appeared reasonably dark, while shadows showed nice clarity. Though this never became an impressive transfer, it looked pretty good for a DVD. 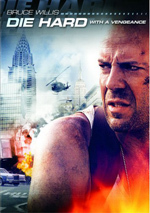 I thought the Dolby Digital 5.1 soundtrack of Unthinkable also seemed fine but unexceptional. Though the subject seemed like something that would pack a lot of action, the focus on interrogation meant the material remained subdued most of the time. Music boasted good stereo presence, and effects offered a fine sense of place. For the most part, they did little more than embellish the environment, though. Though we found the occasional dramatic effect, those remained rare. This tended to be a chatty flick, and the soundscape reflected that. Audio quality was fine. Speech remained concise and distinctive; I noticed no edginess or problems with the lines. Music appeared full and rich, as the score came across well. Effects didn’t often have much to do, but they seemed accurate and lacked distortion or distractions. The track remained too low-key for a high grade, but it seemed good and deserved a “B-“. Only one supplement shows up here: an audio commentary with director Gregor Jordan. He provides a running, screen-specific look at the script and how he came on board, cast, characters and performances, research and working with the FBI, visual design and locations, pre-production problems, editing and an alternate ending. Despite a few slow spots, Jordan offers a pretty positive commentary. He provides a nice examination of the film’s themes and backdrop, and he also gets into the nitty-gritty production details well. I especially like his honesty, as he admits the film was meant for an era with “W” in the White House; he recognizes that it seems dated in the Obama era. Expect an informative, engaging chat here. Unthinkable can be viewed in either its theatrical cut or in an extended version. The latter adds one scene at the film’s end. This sequence examines a plot component left unresolved in the theatrical edition. In his commentary, Jordan notes that he prefers the original ending, and I agree with him. Yes, the extended cut tidies up a dangling story point, but it feels tacked on – which it literally is – and it doesn’t make the movie more satisfying. A few ads launch the disc. We get promos for Shinjuku Incident, Harry Brown, The Square and The Runaways. These also appear under Previews along with promos for Defendor, The Road, Wild Things: Foursome and Chloe. No trailer for Unthinkable pops up here. As a thriller, Unthinkable doesn’t really ignite. The basic subject matter ensures some drama, but it can’t quite fire as well as it should. The DVD gives us reasonably positive picture and audio along with a very good commentary. Unthinkable keeps us moderately engaged, but it never turns into anything particularly memorable.